Its Kitchen Furniture! Need just one piece? Does your kitchen need a little ‘tweaking’ to finally get it right? Does it need more counter space and storage? 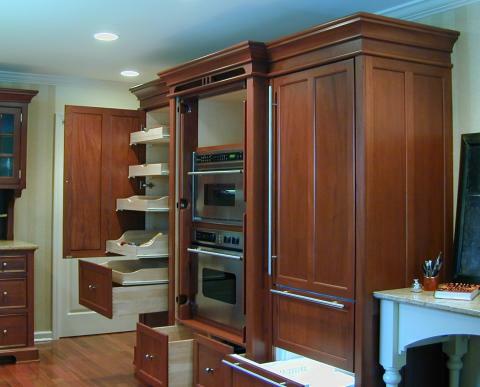 Or do you need a dedicated place to store and use your baking gear? Or maybe you are already tired of that stainless steel refrigerator and you want one that disappears. In this article, we are going to show you some solutions that can solve these problems by adding one freestanding piece of furniture to your kitchen. Its one of the things that Kitchen Workstation Furniture can do best, providing super efficient utility in a beautiful package. For example, in the image above a full size refrigerator/ freezer is concealed right next to the room’s focal point. 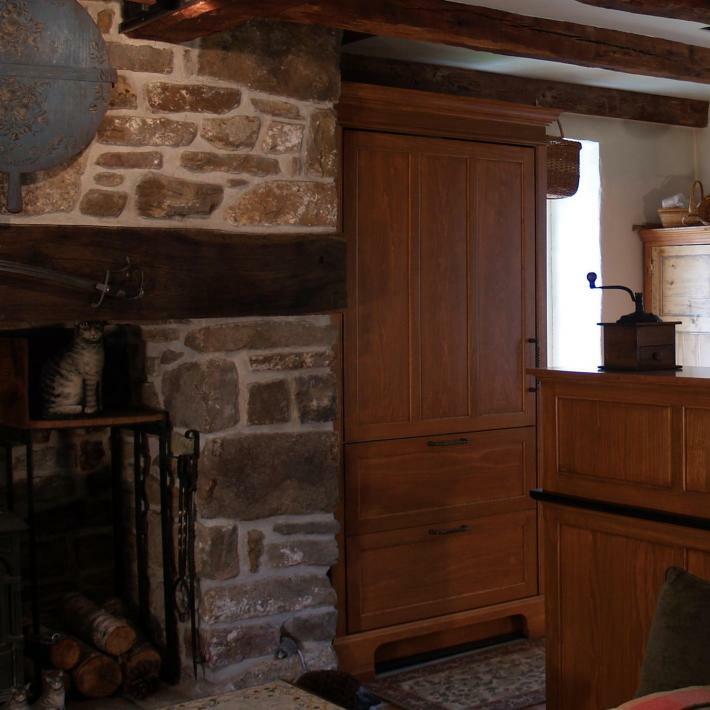 Imagine how a stainless steel refrigerator would spoil the character of this early 19th C farmhouse. 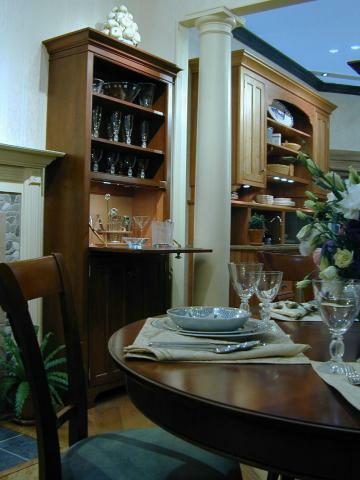 Our most popular pieces of furniture are our Working Pantries! 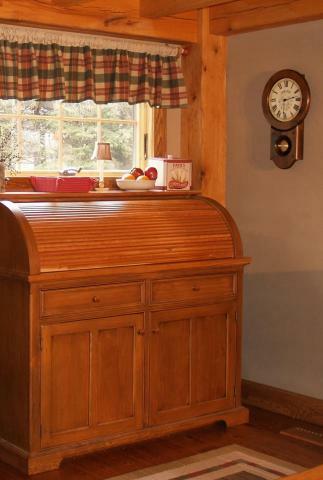 This WP48 is used as a Baking Center complete with a marble top for rolling out dough and plenty of room for everything else that is needed to bake (so I’ve been told) the best apple pies around. 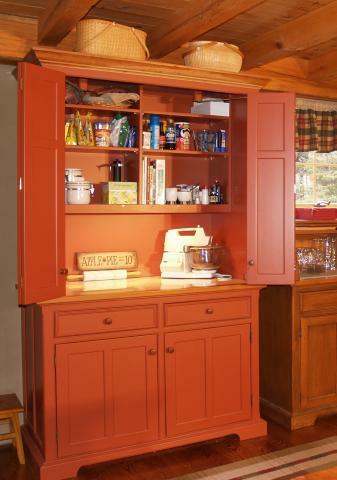 This is a good example of a modern Hoosier cabinet, the indispensable all purpose cabinet of days gone by. Gone are the exposed flour and sugar bins, in fact the great thing about this piece is that it can conceal everything (including the mess) at a moments notice (like the image below)! 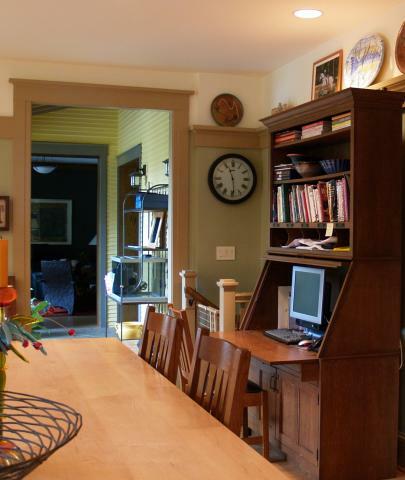 This WP48 was used more as a breakfast bar and working pantry. It straddles the area between the kitchen and the breakfast table, so it is a great place to store dishes, dry goods like cereal, peanut butter, breads as well as the toaster and blender. There’s room for a small microwave too. These units have even gone into a bedroom suite as a snack center with the addition of a small sink and built-in refrigerator. 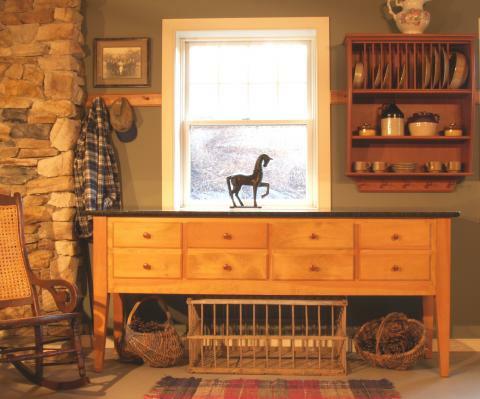 Need more countertop and storage space? These Work Tables (here combined with a hutch top) can be built in 18 different sizes and several styles to accommodate many needs. They can even become island pieces complete with breakfast bars and built-in sinks and cooktops. This C32C Cupboard is being used as a Dry Bar. 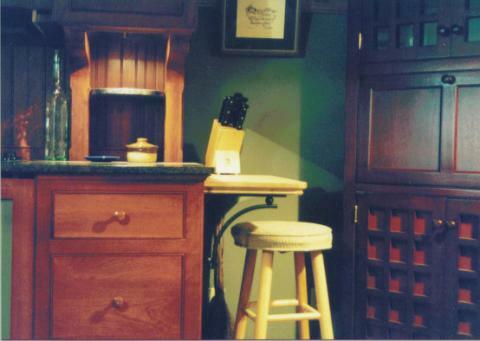 Its fold down countertop provides great workspace and hides the liquor bottles when it is not in use. Its 32″ width allows it to be placed just about anywhere. In fact they have been used as a flanking storage piece next to a pedestal sink, or as a coffee bar, or even as a storage/work center in an office. They are a great ‘second piece’ to accompany an all-in-one mini-kitchen as well. This Secretary Desk, here finished in quartersawn oak is a cousin of the C32 series above. They can be built in 3 widths, and the extra depth below can contain a lateral file or an all-in-one printer/copier and computer tower. The countertop is a clam shell design. 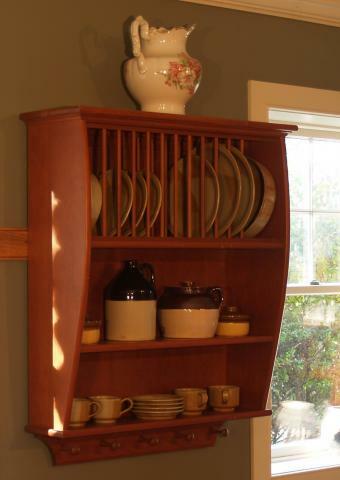 Here is one of many YesterTec Pieces that can be just right for the middle of your kitchen. This one features a built-in Subzero 400 series undercounter refrigerator, lots of storage and a granite top. This Prep Island is made from one of our Worktables and includes a prep sink with disposer and a granite top that has a butcher block surface integrated into it using a sawtooth pattern. 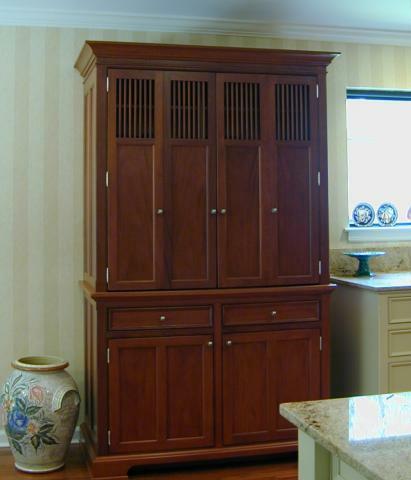 Need to conceal all of the food storage tasks and two ovens? 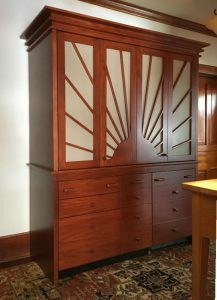 This unit does it all in one piece by combining a Subzero 700 refrigerator/pantry piece and a double oven piece together into one large armoire. Do you need more counterspace, but don’t want it to be exposed? This roll-top storage unit (just the top part) can fit above a storage base to conceal toasters, coffe makers and any other plug-in small appliance that fits. 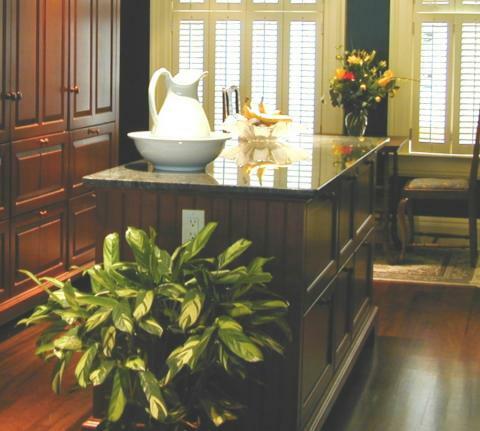 Furniture pieces like these are designed to ‘Hide the Chaos’ that is the normal part of a well used kitchen. Appropriate for adding 12 to 16 inches of length to any countertop, these special Accessory tops are supported by black iron supports. This one adds a butcher block cutting board to the end of this granite top. Adding a granite Accessory top to the end of a wooden countertop can create a place for hot pots to rest. 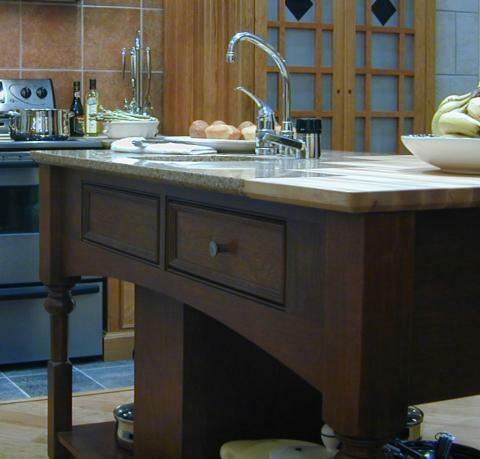 Longer Accessory tops can also be used to add a eating countertop to the back of any island. If you just need some additional shelving, these units may be just the right ticket. They can be made in a few widths and their curved ends are designed to add a little variety to otherwise linear designs. The plate racks are optional and will work on the top two shelves. The plate rack is shown again above with one of our WT-B-82×22 Work Tables, shown in pine with Shaker style legs and a Gold Rush Green granite top. Always finished on all four sides, the worktables are perfect for extra preparation or buffet space. Perhaps the ultimate single piece of furniture is one that can be an entire kitchen. That’s just what these Mini-kitchen Armoires are designed to do. They contain a builtin cooktop, an over-the-range oven/microwave, sink, refrigerator and even a dishwasher. These units have been used as primary kitchens in Studio Apartments, In-Law Apartments, Guest Suites, Rustic Cabins, Extended Stay Hotel Rooms, Executive Suites and Office Hospitality Centers. This particular unit is a UK72 from our Stealth Kitchen Modules line that is specially designed to accommodate additional modules should they be needed. Next ArticleThe Kitchen Focal Point: There are Alternatives!